As part of celebrating over 81 years of continuous publication, the MSR will be republishing notable stories from our extensive archives of more than 4,000 weekly issues of African American news in Minnesota. Many of our readers will be sure to recognize friends, family and neighbors from the distant and not-so-distant past — such as the young man featured in our introductory story below, first published on February 5, 1981, nearly 35 years ago. One might expect a musician who plays 26 instruments and records his albums in a home-made Minneapolis studio to have a lot of formal training. But as Prince confesses, “I had one piano lesson and two guitar lessons as a kid.” At the age of seven, Prince first started teaching himself to play. “My dad left home for the first time and left his piano,” Prince says. “He never let anyone play it before. So I taught myself songs from television — Batman, Man from U.N.C.L.E. I learned to play them by ear.” By fifth grade Prince (his real name) was playing piano in talent shows, and soon after started writing original songs. By 13, he had his first band — Champagne. Champagne played hotels and high school dances, but by the time Prince finished high school, he realized he had far greater ambitions. A break came when Christ Moon, proprietor of a local Minneapolis studio, asked Prince to add some piano tracks to a guitar and voice demo Moon had made. After he put down the piano part, Prince asked Moon if he wanted bass. Moon accepted, and by the time Prince was done, he added base, drums, a guitar lead, and overdubbed his own background vocals. Prince returned to Minneapolis, where meanwhile Moon had played Prince’s work for a local manager. 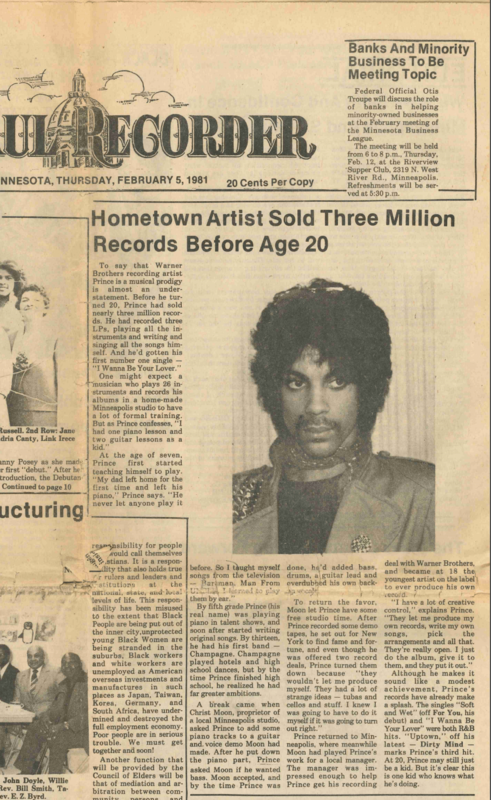 The manager was impressed enough to help Prince get his recording deal with Warner Brothers, and became at 18 the youngest artist on the label to ever produce his own record. Although he makes it sound like a modest achievement, Prince’s records have already made a splash. The singles “Soft and Wet” (off For You, his debut) and “I Wanna Be Your Lover” were both R&B hits. “Uptown” off his latest — Dirty Mind – marks Prince’s third hit. At 20, Prince may still just be a kid. But it’s clear this is one kid who knows what he’s doing.